It may come as a surprise, but when you need another mainframe, you don't have to buy a new one. And you don't have to buy from IBM. You don't even have to use IBM for mainframe hardware support. For most mainframe customers, buying a mainframe is like buying a car  when you can only buy from one new car dealer. You phone up IBM, you order your new mainframe, and it is delivered a few weeks later. But like cars, buying a new model isn't your only option. Second-hand, refurbished, used, or pre-owned. 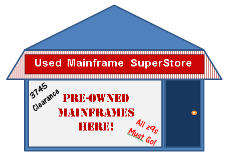 Second-hand mainframes have many names. But in essence, they are mainframes that have been used by another owner, then refurbished and re-sold. Today there is a world wide market for second-hand mainframe parts and equipment, and many vendors who sell it. Australian based HAL Data Services was established in 1993 as such a second-hand mainframe trader. According to HAL Data Services, they will attempt to source any mainframe hardware: from mainframes to disk subsystems and 3745 communications controllers. All second-hand mainframe hardware is fully refurbished, and delivered to the customer's location. HAL also arrange shipping and customs clearances. Independent vendors such as HAL Data Services aren't the only second-hand mainframe suppliers. IBM itself sells second-hand equipment through IBM Global Financing. According to Matthew Stace of IBM Global Financing, IBM has the world's largest global inventory of second-hand mainframe equipment. This equipment, known as IBM Certified Pre-owned equipment, can be on a customer's floor within four weeks if in stock. IBM customers can approach IBM Global Financing directly, or their IBM Client Executive. According to HAL Data Services, second-hand mainframe equipment can be up to 90% cheaper than new equipment. On its website, IBM advertise second-hand z10 EC mainframes from US$390 per MIPS. This alone sounds like a convincing argument. However older mainframe processors suffer higher software licensing costs. For most mainframe customers, the savings just aren't there for mainframe processors, and new processors still win the day. According to an Arcati survey in 2011, only 22% of respondents were running a pre-z9 processor. However there are still other reasons to consider second-hand equipment. Some mainframe users are stuck with old applications or systems that cannot run on more modern processors or equipment. HAL Data Services report that they've recently sold two IBM 9672 G5 processors  mainframes that are 13 years old. Second-hand equipment is also a viable option when software licensing costs are not an issue, such as disk and tape subsystems. Processors required only for a short period of time, or for a disaster recovery site are other potential candidates. Even hardware to upgrade existing mainframe subsystems, like an additional OSA card, can be satisfied from second-hand vendors. Because of software licensing trends and other factors, the second-hand mainframe market has shrunk over the past few years. From early peaks of 70-80%, mainframe hardware today makes up only 5% of HAL Data Service's revenues. Other revenues are from UNIX, Microsoft and networking hardware. HAL also offer hardware leasing services, and can dispose of unneeded mainframe hardware. Mainframe equipment, even older mainframe equipment, has built a reputation on reliability. One reason for this is the high quality servicing of mainframe equipment. New mainframe equipment usually comes with a period of free service from the vendor. Second-hand IBM equipment can also be serviced by IBM  even if purchased from another vendor. According to HAL Data Services, their hardware can be supplied with an IBM Maintenance Service Qualification, or MSQ. This is a certification supplied by qualified IBM hardware engineers after inspecting IBM hardware. It is required before IBM will agree to a service agreement. IBM can also supply an MSQ if required. However an MSQ is not needed if using an independent company such as Australia and New-Zealand based Interactive to service your mainframe hardware. Interactive provide hardware servicing and support for most IBM, Sun midrange/mainframe, and HP midrange systems. They can also support Oracle/StorageTek equipment. According to Interactive, they provide equivalent servicing to IBM at a lower price. A specialist engineer will respond to a call within 10 minutes by phone, and be onsite within two hours for any major city in Australia. They use genuine IBM parts when servicing IBM equipment, and keep a large number of spare parts in the same city as supported hardware. A major reason for using such an independent servicing company is to service older equipment no longer supported by their vendors. Until 18 months ago, Interactive supported an ageing IBM System/36 processor. Second-hand mainframe equipment is always refurbished before being sent to a customer site. According to Matthew Stace, IBM Certified Pre-owned equipment uses intelligence from IBM's global maintenance records to replace any superceded parts. All hardware is brought up to current firmware levels, and tested using the same test cells and programs used for new hardware. IBM Certified Pre-owned equipment comes with at least one year of IBM hardware maintenance. For most mainframe users, keeping up to date with new IBM mainframe processors will always be the preferred option, if only to save money. However in some situations, second-hand mainframe equipment can be a viable option to provide stable, reliable hardware at a lower cost. Investigating alternative ways to support your hardware equipment may also improve the bottom line.